LONDON--(BUSINESS WIRE)-- Technavio analysts forecast the global cervical dilators market to have an incremental growth of USD 59.85 million during the forecast period, according to their latest market research report. The growth momentum of the market is expected to accelerate during the year-over-year growth. 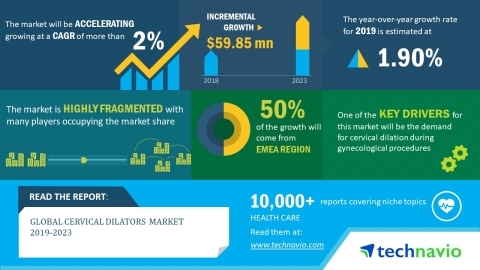 The increasing marketing strategies of vendors for cervical dilator is one of the major trends being witnessed in the global cervical dilators market 2019-2023. Major vendors in the market are adopting innovative marketing strategies to increase their market penetration. Vendors have entered into agreements with group purchasing organizations (GPOs), which in turn, provides them with easy access to hospitals and opportunities to increase the sales of cervical dilators. Thus, these marketing strategies of vendors to increase their sales are expected to increase the adoption of cervical dilators during the forecast period. There is high demand for products of cervical dilators during gynecological procedures such as vaginal childbirth and induced abortions. The process of cervical dilation leads to the opening of the cervix using cervical dilators and this gynecological procedure enables healthcare professionals to track women’s labor progression. Thus, a significant number of childbirths occurring every year across the globe has an impact on the sales of cervical dilator products. The global cervical dilators market research report provides market segmentation by product (metal cervical dilators and non-metal cervical dilators) and by region (the Americas, EMEA, and APAC). It provides an in-depth analysis of the prominent factors influencing the market, including drivers, opportunities, trends, and industry-specific challenges. EMEA held the largest share of the market in 2018, accounting for 45% share. It was followed by APAC and the Americas respectively. The dominance of the Americas can be attributed to the demand for cervical dilation during gynecological procedures and increasing marketing strategies of vendors.